I'm so jealous right now I really really want Bloodrose!!! I hope you continue to enjoy the series, Wolfsbane is even better than Nightshade. Hope you enjoy your books. Shattered Souls looks awesome. Old follower saying hello. MY IMM post will go up tommorow. Mailman is still sorting through the mail. Takes them like forever to do mail in my building. Enjoy them. Being from Montreal didn't gave us the chance to have HBO! I bought True Blood season 3 this summer and I really enjoy it! I can't wait until when the next serie... Even the boyfriend is a fan now an eager to see the season 4! @Alexa I liked Nightshade better than Wolfsbane but I can'T wait for Bloodrose! @Grace Hope you get something good! @Proserpine Actually, we can get HBO in Montreal if you select a specific package from Videotron, but it's expensive and I'm not interested in the other chanels from the bundle. My husband can't stand Sookie lol she's so dumb! Shattered Souls has such a gorgeous cover! Can't wait to get it! Excellent haul! Hurray on Shattered Souls and Bloodrose (already read them and they moved me quite a bit). Oh, great mailbox! I still need to read Matched. Enjoy all your new reads! Unh! So envious of your Bloodrose ARC! Happy Reading! My IMM goes up tomorrow, so be sure to stop by! That looks like some good books this week! Ooh, True Blood, I need to watch the most recent season still - maybe getting it on DVD is the way to do it? Wonderful mailbox, as usual! :) I'm crossing my fingers to get Sins of the Angels next week, it's supposed to be very good :) Enjoy your reading! YAY!!! 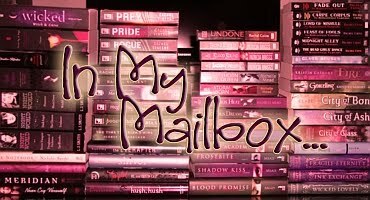 You got some awesome books this week hon!!!*SQUEE! * Thank you so much for the book!! !I`m dying to read it!!! I`m also really happy that you received Supernaturally!!!! :D Happy reading darling! hope to see you soon! @Mocha Glad you liked them! @Ailsa That's what I do anyway. Bought my set for 30$ from a private seller on amazon.ca and got it in 2 days only. @Kara I liked it, it's very different from your usual UF! Shattered Soul sounds great I can't wait to get my hands on a copy myself. Wow, Bloodrose already? I just got Nightshade from the library! I need to catch up! I still need to read the second book before I can get to Bloodrose - those seem to have been coming out quick! Sins of the Angels! I'm seeing this everywhere - are you going to the meet up for this book? Bloodrose, well done!! I have Wolfsbane to read on my book shelf. Hanging to see what Shay and Ren are up to. @AisleB Yes I'll be there on Nov 5th! Shattered Souls does look great! Hope you enjoy it and can't wait to see the review!